Lauren Hudson's book "The Ascension" charted in the Top 10 on Amazon Kindle in Young Adult Fiction. Her follow-up novel, "The Deception," also charted in the Top 10. Hudson will give a talk at 6:30 p.m. Tuesday, Nov. 13, at the Gatton Student Center. University of Kentucky student Lauren Hudson is not your typical college freshman — at age 18, she has already authored multiple award-winning books. "I have been writing since about sixth grade, but I never really knew how much I enjoyed it until a little later," said Hudson, who is majoring in neuroscience in the UK College of Arts and Sciences. "When I was in middle school, my eighth-grade English teacher asked us a write a short story for class. I was so excited about the project that I wrote a 30-page novella in a matter of two days and submitted that as my 'short' story. I think that’s the moment when writing began to hold a special place in my heart and I knew it was something I wanted to pursue in the future." The Kentucky Book Festival, which takes place this week, is featuring Hudson as one of its 2018 authors. She will give a talk with four other authors on campus tomorrow night as part of an event on young adult (YA) literature called "Truth or Dare YA." The free event will be held from 6:30-8:30 p.m., at the Social Staircase in the Gatton Student Center. "To be honored by the Kentucky Humanities Council and to present at my own campus is really a dream come true," Hudson said. "If someone had told me five years ago that I would be presenting to my fellow UK students as a part of the Kentucky Book Festival, I would have said they were crazy. During my time at UK, I can only hope to encourage as many students as possible to pursue their passions and make their dreams a reality!" Hudson will also do the festival's booksigning Saturday, Nov. 17, at the Kentucky Horse Park's Alltech Arena. Hudson, from Villa Hills, Kentucky, co-authored her first published book, "Our Best Tomorrow," at age 13, and soon became a regular on national television and nationally syndicated radio as a middle school student. She then became quickly immersed in writing "The Ascension," which has since become a three-part series. Released in 2016 by Headline Books, "The Ascension" charted in the Top 10 on Amazon Kindle in Young Adult Fiction. 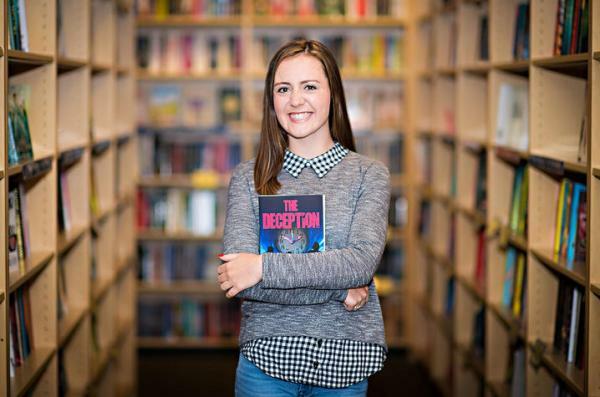 Her follow-up novel, "The Deception," was released this past spring, which also charted in the Top 10 on Amazon Kindle for Young Adult Fiction. The series led to extensive travel, including book events in Los Angeles, New York, London and Washington D.C. Hudson was honored as Independent Author of the Year by the Great Southwest Book Festival for both 2017 and 2018. Her fourth book, "It Can Be Done," will be published in the spring of 2019, and Hudson is currently working on "The Redemption," the third book in "The Ascension" series trilogy. At UK, Hudson is a Singletary Scholar, plays club soccer, writes for the Kentucky Kernel, encourages STEM education to elementary students as part of UK NeuroCats, and is a member of the Alpha Phi Omega service fraternity. And while she has a passion for writing, her dream is to use her neuroscience degree to pursue a career in pediatric oncology. "This past summer, I interned at Cincinnati Children’s Hospital in the hematology/oncology unit, and I can honestly say it was the best summer I’ve had," Hudson said. "After my internship concluded, I knew I wanted to practice medicine for the rest of my life. As a result, neuroscience is a perfect major to prep me to take the MCAT and get into medical school. Although I’m not sure which specialty I want to go into, it is a dream of mine to continue my work in pediatrics at Cincinnati Children’s." For more information on the Kentucky Book Festival, including a full list of sponsors, events and authors, visit www.kyhumanities.org/kentuckybookfestival.html or call 859-257-5932. During the month of November, Headline Books has made Hudson's "The Ascension" series avaialble for 99 cent downloads on Amazon.